One woman didn't know she was pregnant until she found out in an unexpected way—by seeing unusual data readings from her Fitbit and sharing them on a Reddit thread. Who needs a pregnancy test when you can have a Fitbit? The popular fitness tracker did more than just calculate steps taken and calories burned for one woman—it told her she was pregnant. David and Ivonne (who declined to share their last names as Ivonne is only a month into her pregnancy) knew that concieving was a possibility "at any point" but weren't aware that they'd learn of Ivonne's pregnancy thanks to a Fitbit reading, according to Buzzfeed News. David started using a Fitbit, as he was trying to get in shape for the new year. His wife, Ivonne, asked for one as well. She noticed some unexpected readings from the device, though: It was recording her resting heart rate at a much higher range than usual, sometimes up to 110 beats per minute (keep in mind the normal range for an adult is about 60 to 100 beats per minute.) Ivonne assumed the Fitbit wasn't working properly, so she showed it to David, who was an active member of a Fitbit discussion thread on Reddit. David posted about the problem on the Reddit thread. "My wife's Fitbit is showing her heartbeat being consistently high over the last few days. Two days ago, a somewhat normal day, she logged 10 hours in the fat-burning zone, which i would think to be impossible based on her activity level. Also her calories burned do seem accurate. I would imagine if she was in the the fat-burning zone she would burn a ton of calories, so its not lining up," he wrote. "I'm not sure if something is wrong with the sensor. Is there a way to reset or recalibrate the device? I'd like to try that before I contact customer service about a possible replacement." Most of the users didn't take the question too seriously, but one person had an insightful response: "Has she experienced anything really stressful in the last few days or is it a possiblity that she's pregnant?" David said he never knew that increased heart rate was a symptom of pregnancy—but Ivonne took a pregnancy test, which showed a positive result. "We were both obviously very surprised, very happy," he said. As it turns out, an increase in heart rate doesn't usually show up until later in pregnancy. According to Mary Jane Minkin, M.D., what David and Ivonne saw was likely attributed to an increase in Ivonne's body temperature, which can slightly elevate a woman's heart rate. "It's definitely a great story to tell [the baby] one day about how it happened, and [we are] happy to have all the support of people on Reddit," David told Buzzfeed. 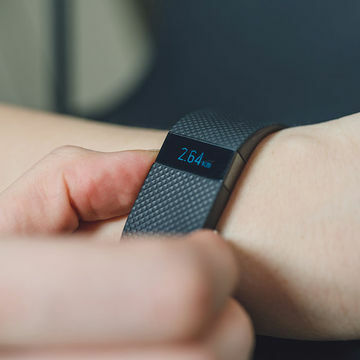 Would you invest in a Fitbit if you were TTC?